If you're anything like us, you love searching for sea glass! Living in Cornwall, we're so lucky that we can escape to the beach to go on a little hunt and find new treasures to turn into beautiful pieces of jewellery or art. We've chosen our favourite sea glass beaches in Cornwall so you can get hunting too! Sea glass comes in all shapes, colours and sizes so it's always exciting to know you're going to walk away with something unique. Of course, you'll find sea glass on most beaches on the Cornish coastline but there are definitely some hidden gems that have a little more to offer! 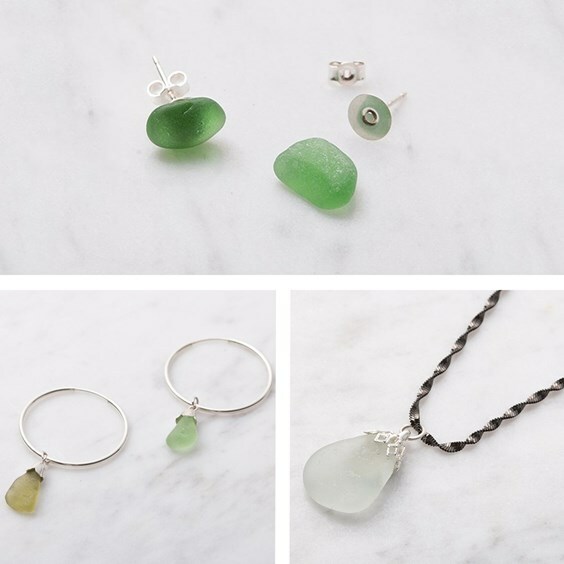 Keep scrolling to watch simple ways you can make handmade jewellery with your collection of sea glass and don't forget to check out our beginner's sea glass jewellery kit here. Get low! 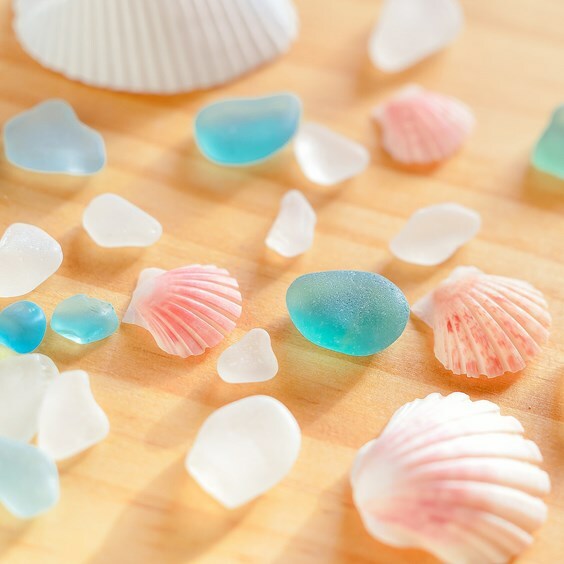 If you're searching for sea glass while simply walking along the beach, you may be missing out on treasures. Get down and stuck in by sifting through the sand and pebbles. One of the best times to visit the beach is after a big storm! More sea glass is likely to wash up, so get down there quick before someone else beats you. Go sea glass hunting when the tide is going in, this way the sea glass is going to be wet which is much easier to spot. Walk slowly, this way you are more likely to spot more sea glass. Pentewan beach is located near St Austell and is a beautiful beach for searching for sea glass. Popular among our team at Kernowcraft, many people have been successful in finding plenty of unique pieces here. Not only is it great for sea glass, but it's also perfect for swimming and watersports too - so why not bring the whole family along on a sunny day! If you're after a big beach, Holywell Bay beach is the place to go. Situated near Newquay on the north coast and hidden by large sand dunes, this beach is a brilliant location to find handfuls of sea glass. There are plenty of rock pools to explore too. Dogs are allowed all year round, so why not bring your furry friend along to help you look! Not only is St Ives one of the most picturesque towns in Cornwall and a firm favourite among tourists, but it's also a paradise for sea glass hunters. You'll find all kinds of treasures, including pieces fo pottery too which is great for all kinds of craftmaking. West of Cornwall, near Penzance you'll find Marazion beach. A stunning coastline, with the view of St Michael's Mount in the distance. It's a long sandy beach, perfect for an afternoon of sea glass hunting. Towards the town, you'll find rockier areas and coves, great for finding sea glass and driftwood. Portreath beach is a lovely little beach to explore sea glass. Located near Redruth, on the north coast, It has a mixture of soft sand and shingle areas filled with all kinds of treasures - plus a great rock pool to explore too. Just around the corner of Land's End, you'll find Sennen Cove. This is a popular beach among locals and tourists, so it can get pretty busy especially in the summer months. Don't forget to visit Sennen Cove harbour too as this is a great spot for finding sea glass. Wondering what to do with your sea glass collection? It couldn't be easier to make your own sea glass jewellery! Get The Sea Glass Kit! At Kernowcraft, we have all the supplies you need to create your own handmade jewellery using your sea glass finds. Watch our video above to gain inspiration and shop the kit to get started. You can pick and choose your favourite supplies from the kit, which includes ideas to make sea glass earstuds, hoops and necklaces.